Everything you ever wanted to know about PPC, SEO, and Content Marketing. It’s not voodoo magic. Arm yourself with the information you need to hold your agency accountable for results. Let’s face it: digital marketing is complex. But your marketing partner shouldn’t use that as an excuse to keep you in the dark as to what they’re doing and how, exactly, it will push the needle for your business. We wrote a 6,500-word guide complete with all the information you need to make an informed decision when hiring a digital marketing agency. You don’t even have to give us your information. If you like what you read, get in touch. If you don’t, then don’t. (But we think you’ll learn a lot either way). So go ahead. Give the guide a read—you have nothing to lose. SEO isn’t magic—it’s a strategy-driven way to attract relevant traffic to your site and drive leads. It’s a combination of on-site content and off-site signals that indicate to Google that your content is worth displaying to its users. Simply put, on-site SEO + off-site SEO = results. You need both components to rank organically. Here’s why SEO is important: when someone comes to Google (or Yahoo or Bing) with a question, Google wants to provide the right answer. And they want to do it quickly, so the searcher doesn’t stop using their search engine. They use an ever-changing algorithm to find, save and provide the information they think most closely aligns with what a searcher wants. Whether the searcher is ready to buy or simply learning more about your service, you want to be visible in results. There are hundreds of factors that affect where your site falls in search engine results. But they can all be distilled into three main components: your link profile, your knowledge of your target audiences and the quality of your content. Think about it: if you’re looking for the ”best lawyer in St. Louis,” you want to find the best. Not the worst one. Search engines look to external signals—links, mentions and reviews—on other sites to determine which sites have the most authority on a topic and the highest relevance to its users. The signal that Google takes the most seriously is your ”link profile”—the collection of links from other sites pointing back toward useful pages on your site. Google takes each inbound link as a ”vote” of confidence in the usefulness of your site’s content and the authority of your business. If a small, lesser known blogger links to you, you’ll get a couple votes. If a bigger, more well-known site links to you, you’ll get a whole bunch of votes. Google takes a holistic look at your votes to decide how reputable you are in your industry and whether to rank your pages. You need to know what your audience wants, and how your product addresses those needs. What are your customer’s pain points? How do they stand to benefit from your product and service? Once you know the answers to these questions—and have content addressing them on your site—you have your customers in the palm of your hand. But you still have to make sure they find your site. We do extensive keyword research to find out how your target audience talks—and searches—about your product or service. For instance, you might think you’re selling ”fitness programs,” but if your target audience almost exclusively searches for ”weight loss videos,” you won’t appear in Google search results when a customer is looking for your product. We’ll direct you toward those phrases and keywords that will get you found by your target audience, and implement them into your content strategy. Well, first off, Google wants to solve problems and answer questions so that users continue to use their search engine. And second, the vast majority of your users aren’t ready to buy. Just give the people what they want: useful content that addresses the intent of the search. Maybe the searcher is ready to buy; maybe they aren’t. Be conscious of the intent behind the keywords you’re trying to rank for. You need to write content that addresses the needs of searchers at every stage of the buying cycle: those who don’t yet know they need your service, those who are researching your product and those who are ready to buy. Buyer behavior is changing. The digital age customer now goes through about 70-90 percent of the decision-making process before even calling you. Answer all of the questions a lead might have during the buyer’s journey, and you’ll see results in the form of rankings and new business leads. There are many ”tricks,” you can use to get around Google’s algorithm and appear in search results. These tricks are called ”black hat” SEO. But Google isn’t dumb. They know when they’re being played. And you should know: legally, Google does not have to display your site at all. Trying to trick Google can result in a penalty, meaning your site won’t be visible to searchers at all. So if you’ve heard an SEO agency promise results that sound too good to be true, they probably are. At Digital Strike, we don’t play games. We’re just really good at optimizing sites and their online footprints. We want long-term results, not quick plays that get results, only to earn a penalty. We have your best interests in mind, and will work tirelessly to make sure you see results in the form of targeted traffic to your site. Then, once they’re on the site, we’ll drive conversion. Yes, there are different kinds of search engine optimization (SEO). We talked a bit in Chapter One about SEO in general just to give you a big-picture idea of what it is. But SEO is a topic so vast and so complex that you could literally write a book on it. So we did. The first three chapters of this guide are dedicated to the various types of organic search engine optimization: on-site and off-site SEO. Let’s launch into this chapter’s topic: on-site SEO. On-site SEO is the process of optimizing the metadata, coding and content of a page to quickly communicate to Google the purpose, intent and value of individual web pages. Along with off-site optimization (covered in Chapter Three) on-site optimization will help drive traffic to your site and, more importantly, convert visitors into cold, hard leads. Clean page and site structure—how users navigate your page—improves the user experience and allows search engine bots to more quickly navigate and index your pages, which can improve both your rankings and conversion rates. Metadata quickly communicates to Google what your site is about. By including targeted keywords in your title tag, meta description and image alt text, Google better understands the purpose of your page. And, if done right, meta descriptions and title tags also entice a searcher to click on your link. Content—especially well-written content—is the crux of on-site SEO. Good content will always win over sparse, keyword-stuffed content. Pages, blogs and downloadables that are shareable, informational and worthwhile will achieve big SEO wins for your company. Below, we’ve explained the guiding principles we’ve found most helpful over years of executing SEO strategies for companies big and small. Does the user know what your site is about and how to use it? We put this first because users always come before search engines. In the old days of SEO, there were ways you could structure your site to ”trick” Google into thinking your site was better than it was. Google’s—and all search engines, for that matter—goal is to provide its users with a good experience. Otherwise, they risk losing traffic to other, more helpful search engines. That’s why search engine algorithms have changed over the years to account for usefulness to the user. Google already tracks how its users engage with your content. If searchers continually click out of your site the moment they enter, Google will be less inclined serve up your site in search results and you’ll lose out on potential leads. Search engine algorithms are getting smarter by the day, becoming better able to exactly match search intent with search results. Looking to the future, your on-site SEO strategy will become a push for optimized user experience—clear, well-thought-out content and an intuitive site structure will win. Black-hat tricks and runarounds will not. It’s always important to remember: Search engines don’t pay your bills. Your customers do. Even if you already have a steady stream of traffic, you aren’t guaranteed conversions. To convert site traffic into leads, you need to lay out your on-page SEO strategy first and foremost for the user. Gear your site toward your target audience—publish useful, keyword-driven content and structure it logically—and search engines will take notice. Sales will follow. At the beginning of any client relationship, we look at how your site is serving your customer. Then we’ll make recommendations that will improve user experience and increase conversion. Can the search engine easily determine what your page is about? Meta tags tell search engines what your page is about. Search engine algorithms are getting smarter every day, but they still rely on clues—meta tags—which give the overarching idea of your page. Title tags are the most important meta tag. The title tag appears as the blue link in Google search results. It should include the keyword you’re trying to target for the search engine. But it should also be readable and enticing to the user, or they’ll scroll right past your result. Meta descriptions—another type of meta tag—aren’t really a Google ranking factor, but they increase the likelihood that a searcher will click on your site. Meta descriptions are essentially teasers for the awesome content you have on your site. Basically, search engines look to your meta tags to determine the purpose of your page and the value it will offer to its users. We write meta tags that will not only increase the appeal of your site to search engines, but also to users. We will repeat: sales, leads and traffic come from people. Not search engines. Is your site structured in such a way that the search engine—and user—can easily navigate it? When a user comes to your site, she should quickly be able to find what she is looking for. It’s the same with search engine crawlers—they should be able to navigate and parse through your content quickly. No page should be more than a few clicks away, no matter where a user lands on your site. There are two ways to go about this: intentional site navigation structure, and interlinking. Good site navigation establishes an easily understandable hierarchy of your website’s pages. It can be in the form of tabs, interlinking structure, buttons, etc. Your navigation should be strategically structured, so anyone on your site can quickly determine your key services, products, markets, as well as any uniquely valuable resources—blogs, whitepapers and guides—that they might find useful. Internal links are another way to aid in navigation. As site visitors skim your content, they might find a topic that piques their interest and want to learn more about it. If you have a page that explains this topic in greater detail, you should link to it. Not only does this aid in user site navigation, but helps search engine bots quickly find and index your most useful pages. The best way to improve your structure is to perform a site audit. By looking at a map of your current site structure, you will more clearly see ways to improve your site’s navigation and usability. Does your page load before the searcher gets frustrated? Searchers expect sites to load fast. With every additional second your site takes to load, the risk that a user bounces—meaning someone hits ’back’ the moment they hit your site—skyrockets. And page speed affects conversions, too. Conversions can plummet by 7 percent after even a 1-second delay. Searchers do not want to wait. Remember: Google’s goal is to give searchers the answer to their question without frustrating them in the process. Page speed is, therefore, one of their ranking factors. So how do you increase your page speed? There’s no one-size-fits-all answer, but clean code, compressed images and browser caching can go a long way toward reducing page load time. Is your site optimized for all devices—desktop, mobile, tablet? In 2016, mobile internet usage overtook desktop internet usage. Now, more searches are made on mobile than on desktop. And Google has taken notice. Currently, your site ranks because of its desktop version. That will change, and soon. Google is changing to a mobile-first index, meaning that if your site isn’t responsive on mobile devices—iPads, Surface tablets, iPhones, Androids and the whole host of other products on the market—you will fall behind the competition. As responsive web design becomes a competitive SEO factor, mobile-readiness is not a ”nice thing to have”—it’s an absolute necessity. Is your content optimized for what your target audience is searching for? Does your content satisfy the intent behind the search? This might seem obvious, but if you want to rank for what you do, you need to write useful content about what you do (your services or products) and who you sell it to (your markets). You also need to anticipate—and answer—any questions your ideal buyer might have at all point of the buying cycle. You also need to talk about your services and products using the words and phrases your ideal buyers use. That’s where keyword research comes in. There are a variety of tools—Adwords Keyword Planner, Ahrefs, SEMrush and others—that allow you to see how your audience is searching for the products and services you sell. Once you know how your audience talks about your business, you can use the same keyword phrases they’re using in your content. That way, we create the opportunity for your site to appear when users search products and services you provide. If, for instance, you use the phrase ”residential roofing contractors”—which your target audience is searching for—1-3 times in a really useful page about residential roofing, you stand a chance—along with a robust link profile—of ranking for that term. But it’s not as simple as just choosing keywords and writing about them. Keyword targeting should also take into account the intent of a term. The first searcher is looking for information, while the second searcher is looking for a service. These two pages should, therefore, look very different. If your site uses the phrases your audience is using, and answer’s their questions, leads and sales will follow. 100 billion searches are made per month on Google alone. Google competes against other search engines (think Bing, Yahoo, Ask Jeeves) to retain that high level of search traffic. As mentioned in Chapter One, Google goes to great lengths to make sure the results to each of those 100 billion queries are exactly what the searcher was looking for. They know if the user doesn’t find what they want, they’ll get frustrated and move on to another search engine. So how does Google decide which sites are useful and relevant enough to display? A couple factors. As you’ve already learned, having an optimized site helps. Are other sites linking to yours? Your link profile—the number and type of sites linking back to pages on your site—is by far the most important off-page SEO ranking factor. Google trusts that if other sites think your content is useful enough to link to, then your site will probably be useful to their users, too. Earning links through relevant and helpful content will help you rise in the ranks of Google search results, driving relevant traffic to your site and ultimately drumming up dollars-and-cents business for your company. Each link is like a ”vote” of confidence in your brand. Earning a link from a well-known publication (i.e., Huffington Post, Forbes, USA Today) will earn more ”votes” than one from a little-known blogger. But all links matter and all links count. Still, it’s not a good idea to simply pay another site for links—in fact, unnatural links can result in a penalty from Google—you need to be strategic when building backlinks. Each digital marketing strategy that Digital Strike develops includes a robust, long-term link building strategy that will increase your site’s authority and drive business for your company. You need an audit of your current link profile. From there, you can target well-known bloggers, publications and sites relevant to your industry, so that Google—and your target audience—will see you as a trusted resource. Google looks at more than just backlinks. When bloggers, publications, social media users and other sites mention your site—even without giving a backlink—Google takes that as a signal that your brand is popular or useful. Brand mentions matter less than backlinks, but are nonetheless important as an off-page SEO ranking factor. At Digital Strike, we aim to earn brand mentions through excellent content about your product that people can’t help but talk about. To rank locally, you’ll need to follow the on-site and off-site SEO best practices we already talked about in Chapters 1-3, and some other elements specific to the region or town you’re trying to optimize for. We’ll first explain what local optimization is, and then explain how it works in practice. To be seen by local consumers before they make a purchasing decision. Local businesses—and, for that matter even big businesses like Target and Starbucks—rely on this. Google can determine if there is local intent behind a search—or, in other words, if a searcher is looking for a local product or service to satisfy a need. Terms like near me, in Chicago or the addition of any other city name to a keyword indicate local intent. As with all other searches—like the types of searches we talked about in Chapters Two and Three — Google displays the most relevant web pages and business listings in the results. But there are slight differences with local intent search results as compared with non-local search results. You’re in Miami on vacation with your friends and you’re looking for a nail salon. 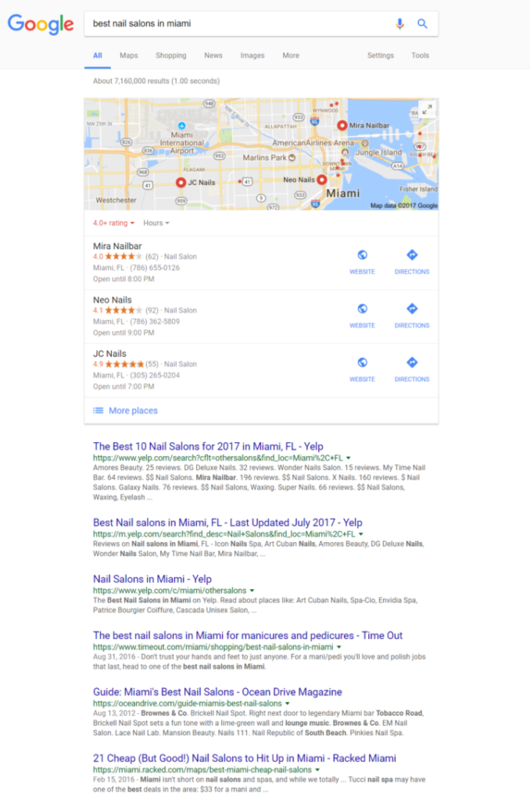 You might search ”best nail salons in Miami” into Google. There’s a geo-modifier in your search, so Google instantly knows your search has local intent. As you can see, Google splits local search results into two categories: the local 3-pack and organic search results. The 3-pack appears at the top of the results, with organic search results below. 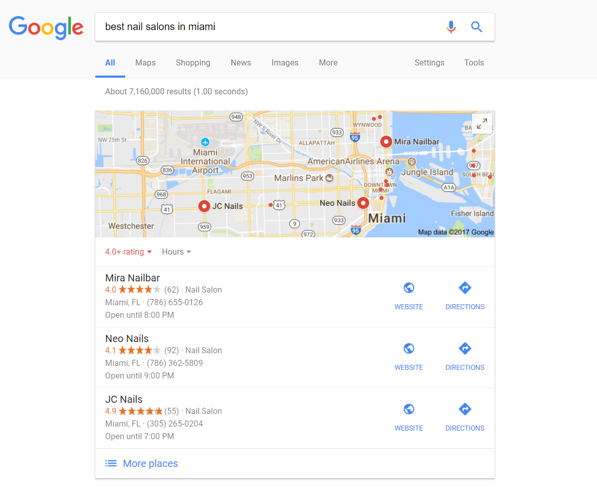 Local searches—like yours, ”best nail salons in Miami”—often carry purchase intent, especially when done on a smartphone. If you are searching this, you want to go to a nail salon—if not today, then soon. It is highly likely you will look at the reviews and photos, consider your options and schedule a manicure or pedicure at one of the businesses listed in the local pack. In fact, the local pack has a conversion rate as high as 60 percent. No wonder so many local businesses fight tooth and nail to get into the top 3 local listings or on the first page of local organic listings. Here’s the kicker: ranking factors (think: reviews, link profiles, proximity) are weighted differently for the 3-pack results than they are for local organic results. The local 3-pack displays relevant Google My Business listings, although hundreds of other factors are taken into account when Google ranks one business over another. Local organic results display relevant web pages—not business listings. Again, hundreds of other factors are considered, namely your on- and off-site SEO efforts. Several prominent factors for each type of local search result are listed above, but there are much more than just three. Just look at Moz’s annual local search ranking factors survey. 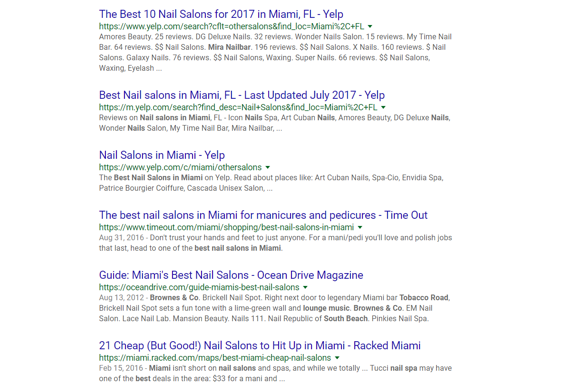 So the question is this: If you are a nail salon in Miami—or any other local business—how do you generate business from the keyword, ”best nail salons in Miami”? And that’s why many marketing companies throughout the country have been able to build a business off of local search optimization. Local businesses—and even national chains wanting to rank locally—need to optimize for local to generate leads. And few know how to execute effective local SEO. But, the complexity of local SEO also allows other digital marketing companies to treat it like voodoo magic. We don’t. We like to educate our clients so they know what they’re paying for, and so we can set reasonable expectations for how it might work. For instance, you can expect transparency in the form of data-driven monthly reporting, and results in the form of leads and growth. We know what we’re doing when it comes to local SEO. And, honestly, not a lot of people can say the same. There are a lot of factors to consider when developing a local SEO strategy. But, like any other complex profession, there are basics that will set you up for success. Take the medical profession for example: Your doctor might recommend you schedule a check-up every six months and appointments as different ailments arise. Those two recommendations don’t begin to cover the complexity of what you—as a patient—need to do to stay healthy. Still, they’ll go a long way toward preventing disease and supporting your general well-being. It’s the same with local SEO. There’s no way we could cover everything you need to do to rank and win business on one page. Or, at least, one page that you could read in one sitting. But we, like the medical profession, have basic principles. The basics alone won’t guarantee results, but they’ll go a long way toward getting toward pushing you in the right direction. Can Google trust that you are who you say you are? You need to build trust with Google that you are who you say you are. Make sure your business name, address and phone number (NAP) is correct across the literally thousands of online directories. Otherwise, Google won’t want to show your site off to its searchers. Because Google doesn’t want its searchers to get frustrated by a phone number that doesn’t work, or an address that’s incorrect and switch to Yahoo or Bing. Digital Strike’s team of SEO experts will set up your directory listings to be accurate, and check in to make sure they stay up-to-date. This way, Google will feel more comfortable showing your site off to searchers. Reviews matter. Search engines don’t want to display content about unpopular businesses and products. Google, Yahoo and Bing want to provide valuable content or solutions from reputable sources so their searchers keep coming back. That’s why managing your online reputation is so important to SEO. We’ll help you manage your online reputation through review-building campaigns (requesting reviews from past customers). We know you’re going to reply to your good reviews. But it’s important to address your bad ones as well. We’ll be on the lookout for bad reviews. When they do pop up, we’ll let you know so you can respond to negative comments or reviews. With a well-managed online reputation, Google will feel comfortable displaying your site to its users. Links are one big way search engines measure relevance. The more sites—especially sites important in the city where your business is located—that link to you, the more relevant your business will seem to Google. If local newspapers, magazines and bloggers in your city are all talking about how great your business is, then Google will get the hint and display your business in its search results. But link building isn’t as easy as it sounds. It requires a comprehensive strategy. Quality and quantity of links matter. So does the content of the article in which your business is mentioned. Anyone can direct links to your site. But if best practices are not strictly followed, your site can be removed from Google altogether. Precise and intentional strategy is key to any successful link building. We’ve developed effective strategies for a variety of businesses big and small, and we can develop a customized solution for you, too. Is your SEO agency keeping up with Google updates? We’ll say it once and we’ll say it again: the only constant in local SEO is change. Google is constantly rolling out updates to its algorithm so it better serves its searchers. Your SEO agency needs to keep abreast of these changes so you can stay ahead of your competition. Digital Strike’s local SEO team is working in the trenches testing what works and what doesn’t. Plus, we’re pretty passionate about local SEO, constantly reading and learning about changes in the local space. Many in the industry look to Digital Strike for advice when it comes to local SEO, listening into our monthly, partners-only local webinars for agencies. We are constantly re-thinking how we approach local because, otherwise, we—and our clients—would be left behind. We’ll constantly update our partners and clients with new tactics, strategies and tricks we’ve found through our extensive research about and passion for local SEO. Useful, well-written content pieces are the lifeblood that makes SEO work. No SEO campaign can reach its full potential without killer content that converts. Think about it: even if your SEO campaign draws millions of website visitors a month, no one will convert into a lead if your content isn’t helpful. Likewise, even the best content won’t convert if it never gets seen—good, white hat SEO tactics and paid search marketing boost the reach of your blogs, pages and premium content pieces. And, because customers are making 70 to 90 percent of their buying decisions through online research before ever contacting your sales people, you cannot afford not to be absent from search engine results when they begin asking questions online about your services. In the golden days of marketing, you could address a prospect’s questions through mass media marketing or a sales call and close the deal. No longer. Content marketing is the new sales process. A prospect’s questions are being asked and answered online long before you even know the lead exists. You need to have SEO-optimized content pieces armed and ready to answer your prospect’s question at the right time. If you aren’t there to satisfy the intent of every search a potential lead is making, they will become your content-marketing-savvy competitor’s customer. You need a customized content strategy that addresses all the questions your ideal buyer might have from awareness to consideration to purchase—and everything in between—that will eventually make your future clients comfortable making a buying decision with your business. In order to determine how to best go about achieving your business goals through a content marketing strategy, we have to, well, know your goals. 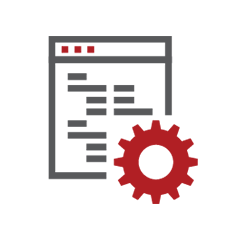 We’ll schedule a meeting to learn more about your company’s vision, brand, target audience and business goals. Only then can we begin developing a strategy that will help push the needle for your company. We believe in the old adage: if it ain’t broke, don’t fix it. If you have content that’s already working for you, there’s no need to change it. We’ll do a deep dive into what’s working, what’s not and where the holes are. If there are questions that people are asking—and you’re not answering—we’ll note that in our formal content gap analysis. Our strategy will be built upon bolstering the weak spots and building upon what’s already performing well. The essence of any good content strategy is writing directly to your audience’s pain points, questions and desires. To do this, you need to know your ideal buyers better than they know themselves. It’s simple: research how they talk—and search—about your business, services and understand the key drivers that lead to a purchasing decision. You need to know the questions they’re asking before they know about your product or solution, while they’re researching their options and after they’ve decided to make the purchase. And you need to know which keyword phrases they’re using to ask these questions, so you’ll be present in search engine results as the answer. Once we know which questions your audience is asking—and how they’re asking them—we can develop a data-backed keyword list that will serve as the basis of our strategy. From there, we can determine the intent behind each search—information, product or service specifications, etc.—and write content that will satisfy that intent. No company is the same, and no two of our content strategies are identical. We don’t take a one-size-fits-all approach to content strategies—we’ll get to the root of your target audience’s pain points, and address them through well-researched blogs, guides and pages. A good content strategy serves to hold the prospect’s hand and push them further along in the buying cycle. Useful, helpful content gives prospects the nudge they need to advance from researcher to lead to paying customer. Sometimes, our strategy starts with building a sitemap that addresses your key services and markets. Other times—such as when you have a good site already—this strategy will mostly include informational blogs and premium lead generation content pieces to fill the gaps and drive conversions. We’ll tailor our strategy to your needs, goals and audience. Only once we have the destination (your goals) and the map (our strategy), we’ll sit down to write. We’re really good about getting in the head of your target buyer, knowing their objections, concerns and questions—and addressing all of them. At Digital Strike, we operate by the belief that content marketing campaigns should achieve results. So we write content that works. After all, strategies are worthless if the execution is slipshod. We obsess over sentences, lose sleep over calls to action and, most importantly, write content that turns searchers into paying customers. Most of what we’ve already talked about—organic search engine marketing—is a long-term play. We build authority for your site over time through link building, content creation and citation building, and eventually you start ranking for the keywords you want. Pay per click advertising helps you get quick wins, supplementing your long-term organic SEO and content strategy. PPC also helps promote limited-time campaigns, win competitive industry keywords, and increase the reach of your organic SEO efforts. It’s pay to play: you bid on the keywords you want, and you will appear in the search results. PPC is the only digital marketing tool that will produce immediate results. And it isn’t disruptive. Someone has a need: let’s say they want to order a pizza. They might Google ’pizza near me.’ If you bid on pizza-related keywords, you’ll appear in the results. You’re giving them what they want: pizza. You’re getting what you want: a pizza order. Essentially, pay per click advertising allows you to target based on intention. Your ad appears at the right time (someone wants your service) in the right place (the top of the search results). And, just like that, you have an engagement, sale or lead. PPC advertising doesn’t just occur in search engines like Google, Yahoo and Bing. Cost per click can also refer to social media advertising on platforms like Facebook, Instagram and Twitter. Social media advertising allows you to put your message in front of your target audience and track engagments (clicks, people reached, social interactions) over time. Sounds easy enough, but advertising on social media requires intentional strategy about who you’re targeting, how much you’re paying per interaction and whether each campaign is driving results in the form of website traffic, lead conversions and sales. You can’t simply ”set it and forget it.” Our team of paid advertising strategists has spent years perfecting their campaign strategy. They know how to make sure your ad gets in front of the right audience, and that it converts. And, because we provide you with a transparent results dashboard at the end of each month, you’ll know exactly how well our campaigns perform. You’ll remain in the loop from the start of the campaign until the end. 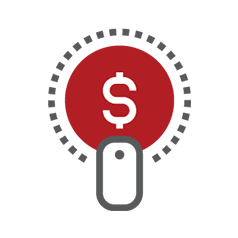 When it comes to PPC, our main goal is to drive leads and increase profit for your business. We optimize so that your campaign attracts many clicks, and that those clicks convert to leads and sales. We’ll tell you the whole story: where your money is being spent, where leads are falling off in the conversion process, what keywords are converting at the highest rates. We’ll even tell you when our initial strategy needs to change. You need a team that understands the PPC world inside and out and can modify your PPC strategy as the digital space changes. Plus, your company’s PPC team should be dedicated to continually optimizing your campaign. Our team will send you a report every month detailing every success—and failure—and how we plan to make your campaign more efficient in the future. Your PPC campaign should be focused on a goal, whether it’s increasing calls, whitepaper downloads, newsletter signups or getting more people into your store.Digital Strike’s team of PPC experts will build a campaign with your business goal in mind.We’ll choose keywords that indicate the searcher is looking to buy into what you’re selling, and we’ll write ads that showcase the value of your service. Once a searcher clicks on your ad, they’ll be taken to a landing page on your site.This landing page should urge the searcher to do something such as call you, download a white paper or request a free consultation.We track these engagements, and report it to you at the end of every month. Using the initial and lifetime value of your average customer, we’ll let you know how much you’re making off your PPC campaign. PPC is about results. You need to know whether the campaign is driving leads, and how much every engagement is costing you. We’ll give you a comprehensive summary of your campaign every month. In the report, we’ll tell you what’s going well—and what’s not. If something isn’t working, we’ll come to you with a plan to fix it. At Digital Strike, we’re problem solvers. PPC isn’t one-size-fits-all, and we’re constantly adapting keywords, spend and build to make sure you’re spending your budget efficiently and meeting your lead goals. To quote Mike Tyson, everybody has a plan until they get punched in the mouth. Everything might be perfect in the Excel sheet, but if the initial plan isn’t working your PPC management team needs to be able to adapt quickly. Maybe lots of paid traffic is coming to your site, but no one is converting into a lead. Maybe too few people are clicking on the ad. Maybe some keywords are converting at a higher rate than others. Maybe the cost per click is too much. At the end of the day, the goal of any PPC campaign is to drive leads for your business for as little money as possible. Our PPC managers will draw on their vast experience in paid search to make sure your business’ campaign is successful. Each month our team of PPC experts will go through your campaign and find ways to spend your budget more efficiently. They’ll get rid of keywords that aren’t converting. They’ll look at which ads were performing the best, and focus media spend on those.